Open-eyes at the setting of day. In great crimson thickets that cover the wall! And a sunny blue sky over all. And down through the meadow-grass run. And the dew gathers soft in the sky. Of insects too happy to sleep. 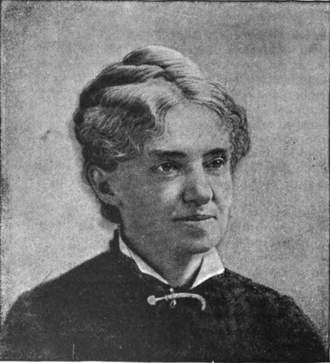 Mrs. Woolson lived from 1838 until 1921 and was a native of Maine. In 1915 she published the above poem as part of a collection of works in her book, With Garlands Green. I couldn’t think of a better way to start my June post than with her lovely words. 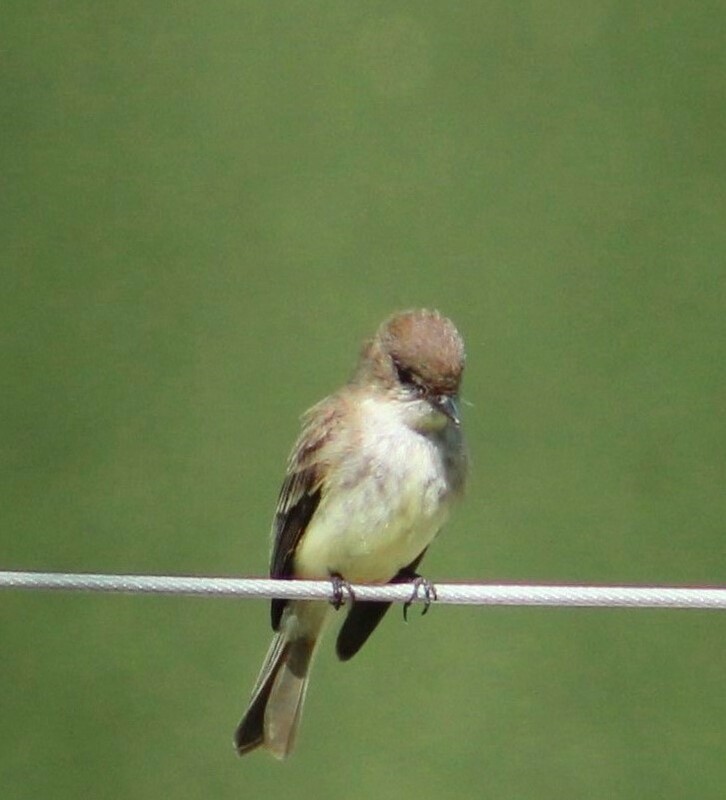 Hello to my Eastern phoebe. With his territory long-ago established, he’s fallen silent these past weeks, no longer filling the air with his characteristic ‘fee-bee’ call. That’s okay. I have loads of other birds to listen too. 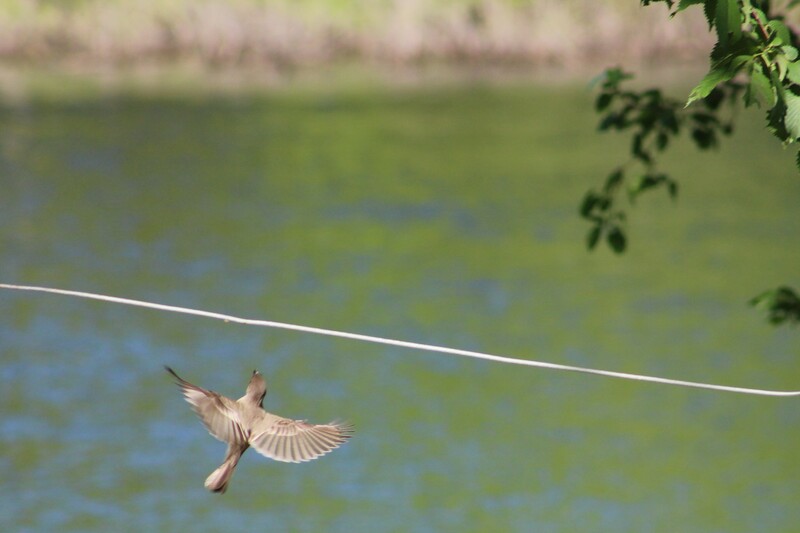 As for Mr. Phoebe, I get to enjoy his antics as he captures all manner of fluttery insects on wing. 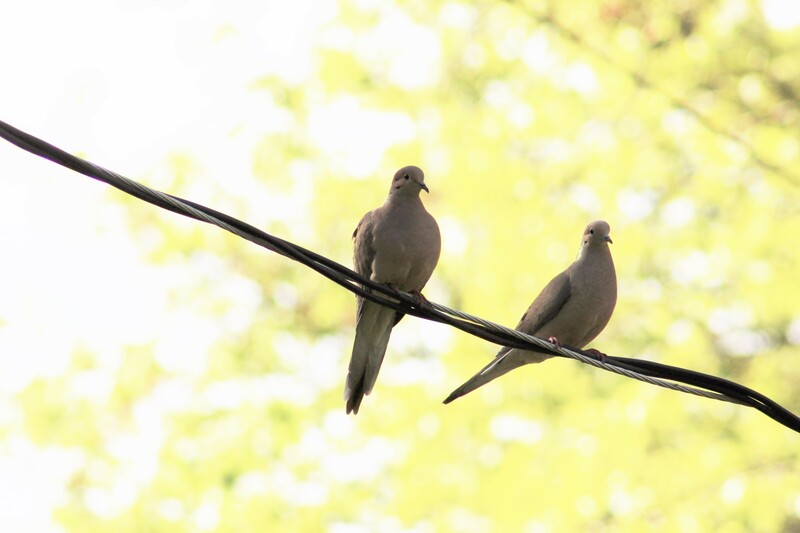 Here’s another pair of silver-brown birds, my serene mourning doves. Their call, a sorrowful ‘coo-coo’, brings to mind someone lamenting over the loss of a loved one. Not the most joyous of songbirds, but, still, a joy to behold. 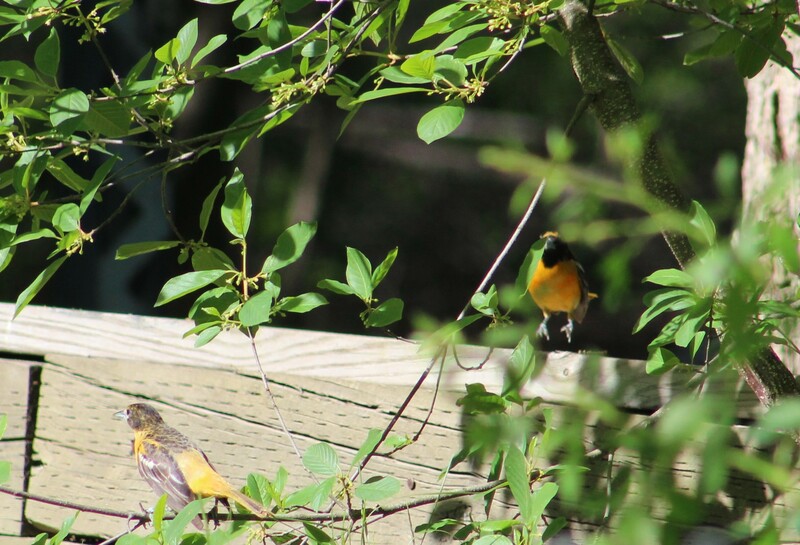 One of the most vocal songbirds spending this summer with me are the Baltimore orioles. My photos don’t do them justice, especially when two males are vying for the affection of a single female. 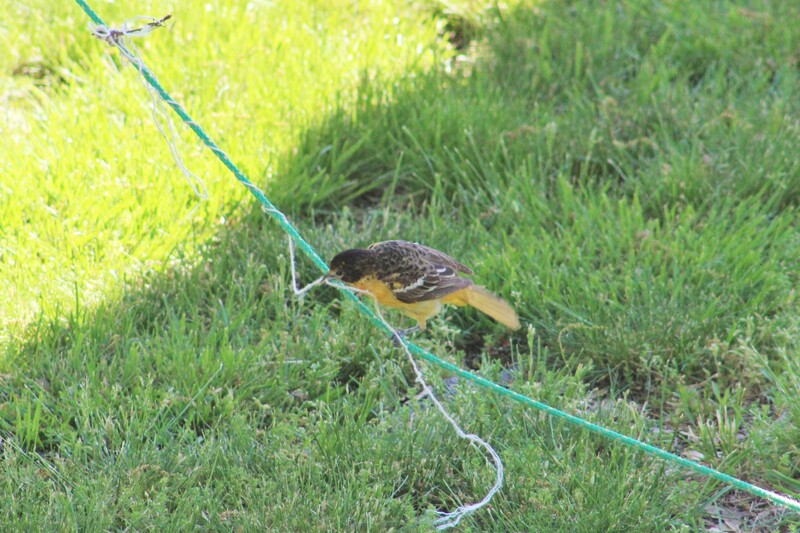 I learned something this breeding season; Baltimore orioles use a similar courtship technique to Northern cardinals. 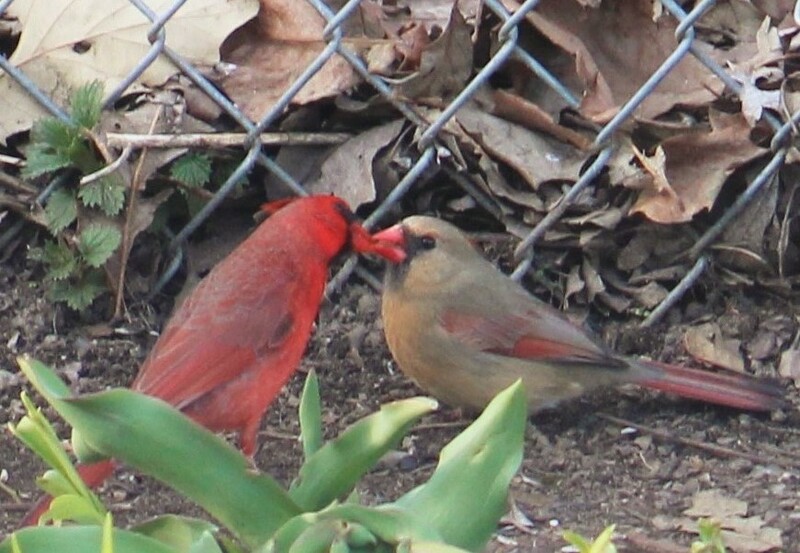 A Northern cardinal male will feed the female sunflower seeds as a way to form a breeding bond. 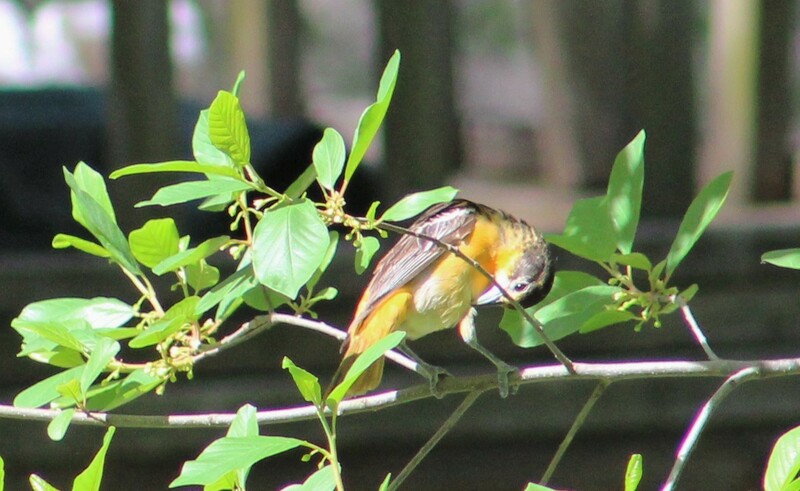 With Baltimore orioles, the female flaps her wings and ‘cheeps’ like a fledgling to entice the male to feed her. Hey, some guys like baby talk and some don’t. It’s all good. Once the breeding pair has been established, the female starts collecting material for her nest. The female in the lower photo was having a little trouble. She had her heart set on a piece of string attached to Harlee’s run. I helped her out by cutting off the string and adding a few more strands around the yard. 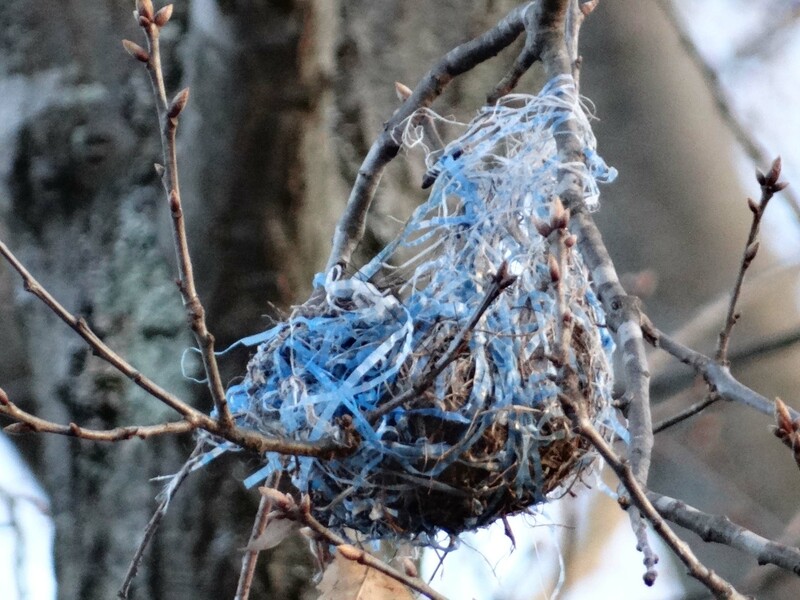 If you’ve never seen a Baltimore oriole nest, you’re missing out. They weave the nest using just their beaks! Here’s a tutorial for those of you with a need to understand the process. These are such cool birds, they might just become my favorite type. Or, they might not become my favorites. 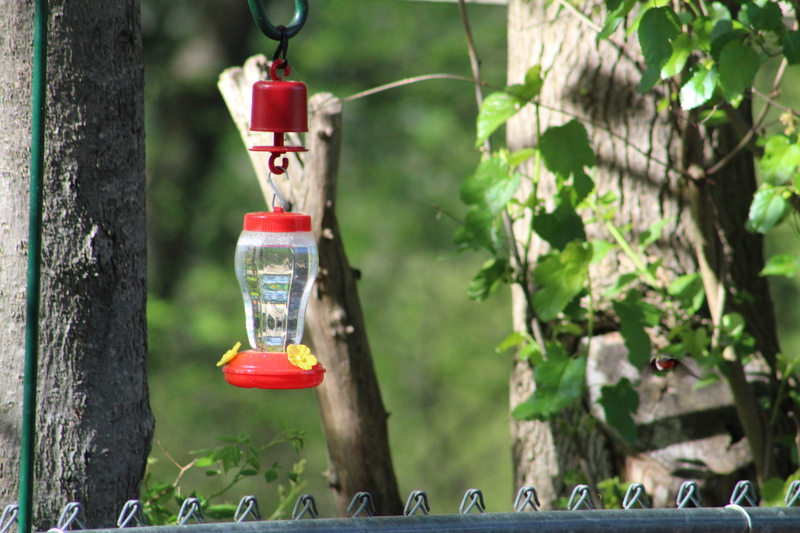 Not when the ruby-throated hummingbirds are around. This last picture is like a Where’s Waldo pic. Can you find the hummer? 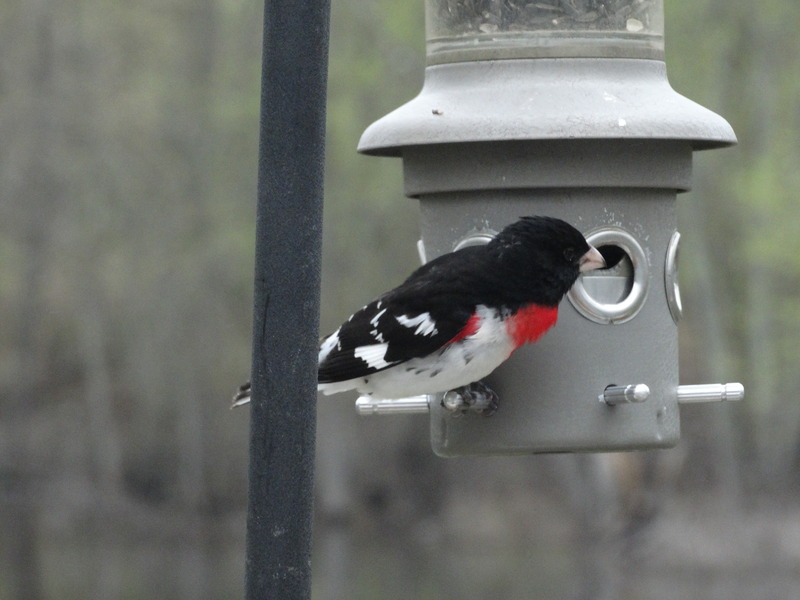 If I’m picking favorites, the rose-breasted grosbeak needs to be added to the list. 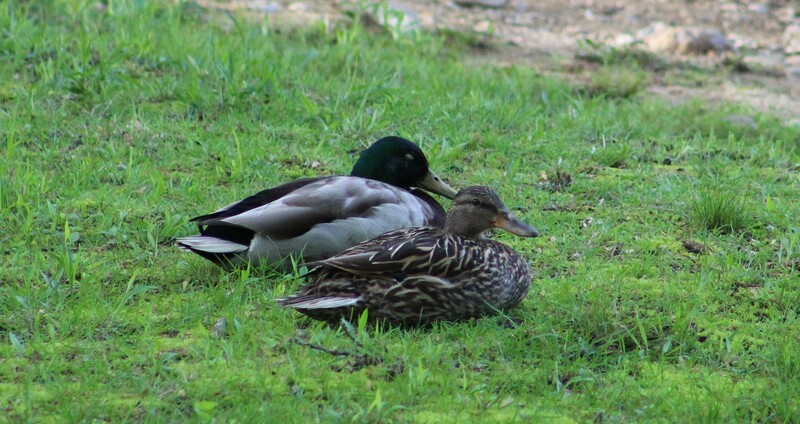 Although I only get a single glimpse each breeding season, it’s always worth the wait. Rose-breasted grosbeak at the bird feeder. Stunning. 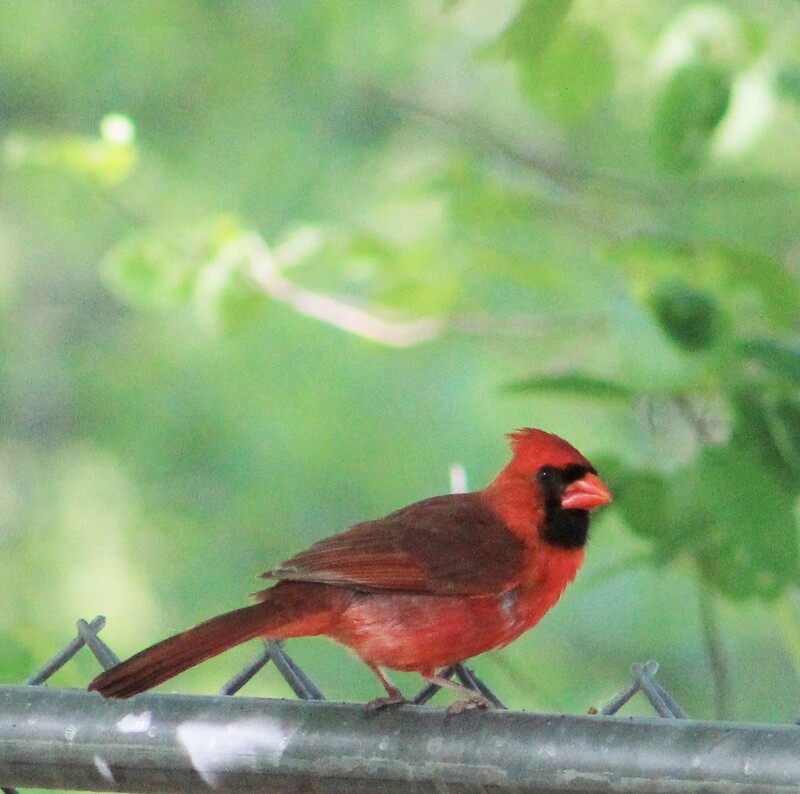 My mother’s favorite songbird was the Northern cardinal. This one’s for you, Ma! Whenever a hen flies by some of the males will take off in pursuit. One lucky guy actually got himself a second mate. The lucky fellow with his new bride. 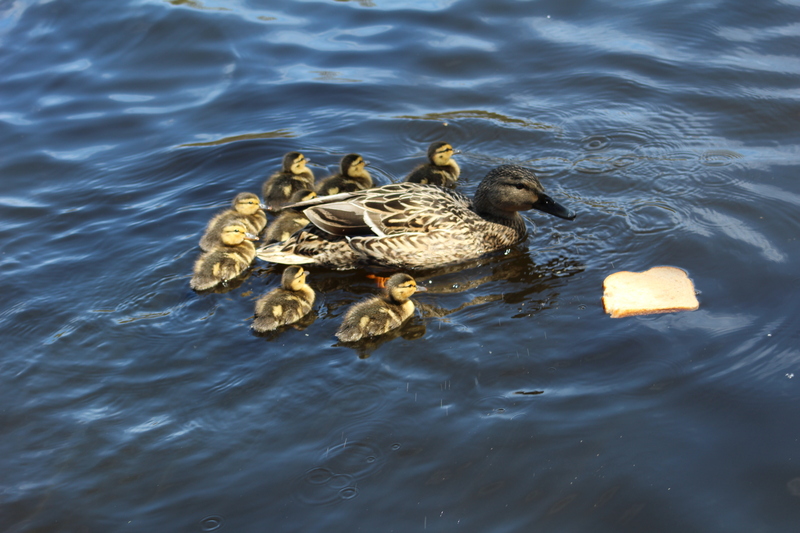 As I mentioned, no ducklings yet. This time last year, I was swimming in chicks. I don’t know if it’s all the rain we’ve been getting or the chilly days and nights, but the beaches are barren. 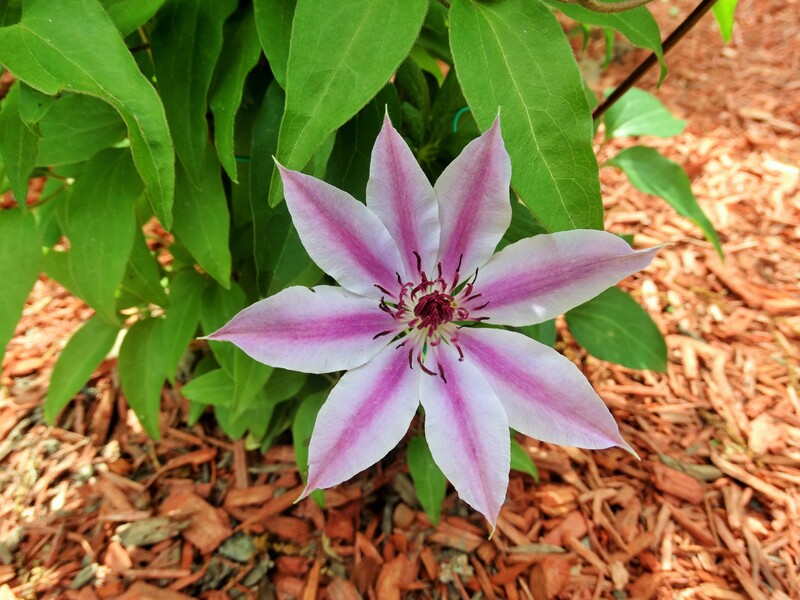 My last topic is my clematis vine. It finally bloomed! After two years of nothing, I have a blossom. You should have seen me dancing around the yard, whooping and singling. My joy was short-lived because when I took Harlee for his walk I passed a house with a vine sporting about a gazillion blossoms. Oh well, someday. Sigh. In parting, I hope your June is wondrous and filled with health, love, and the colors of Mother Nature. Gallery | This entry was posted in Life on the Concord River and tagged a blog about living on a river, A Summer's Day, Abba Goold Woolson, animal behavior, Baltimore oriole nest, Baltimore Orioles, birds of the Concord River, breeding behavior of Baltimore Orioles, clematis vines, ducklings of the Concord River, eastern phoebe, great blog about living on a river, life on the concord river, living on a river, living on the Concord River, mallard ducks, Mallards, natural history blog, poems about June, poems by Abba Goold Woolson, River Lady, riverlady, rose breasted grosbeak, Ruby-throated Hummingbird, ruby-throated hummingbirds, single woman living on a river, songbirds of New England, stories about living on a river, stories about living on the Concord River, the month of June, video about ducks, With Garlands Greet by Abba Goold Woolson. Bookmark the permalink. 3 Responses to I know in my heart it is June. I think your email came at the perfect time for me as I am searching for a new home for my two beloved cats. Know of anyone who may want a cat? I have two sibling female cats I rescued. They are about 3 yrs old and enjoy outdoors and in. Due to allergies I must find them a good home. If you are interested or know of anyone I could call please let me know.